Whether your tastes run to bestsellers such as The Da Vinci Code and The Rule of Four or you prefer the New York Times’ coverage of the Presidential inauguration, you probably have been reading recently about secret societies. You may even have turned to wondering about secret societies at Wesleyan, and how they compare to, say, Yale’s Skull and Bones. Of course, some of you?and only you know who you are! ?have no need to wonder, because you’re the keepers of the secrets. 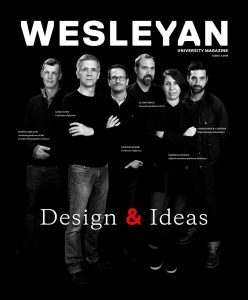 But for the rest of us, Wesleyan’s secret societies offer a tantalizing peek at hidden rituals of the past, some of which survive today. Before you read any further, rest assured that this column reveals no secret information. If I were privy to anything secret, I wouldn’t be able to (or want to) reveal it. Nevertheless, there are some mysteries that are open to public scrutiny. All of my sources have been published or are otherwise readily available in the University Archives. Wesleyan’s best known and most active secret society, Mystical Seven, is one of the university’s oldest student organizations. Founded in June 1837, by seven students, Mystical Seven predates Wesleyan’s Greek letter fraternities. At the time, student extracurricular life was dominated by two rival literary societies, Philorhetorian and Peithologian. Hamilton Brewer (Class of 1838), known to Mystics as “The Sacred Brewer” for his primary role in founding the society, and his fellow founders invented a complex, arcane set of practices and rituals, including pseudonyms, a special calendar, a vocabulary, and their own code of parliamentary procedure. Nearly everything involved the number seven: the year of founding, number of original founders, seal, songs, colors, and ritual poetry. Mystics referred to Wesleyan as the land of “Willburia” after President Willbur Fisk, who approved the original constitution (but to whom no secret rituals were revealed). In the 1840s, Mystics began a campaign to spread the society to other colleges. Wesleyan Mystics helped to found chapters of Mystical Seven at 10 or more other schools, mostly in the South. Only the chapter at Emory, founded in 1841, is active today. Wesleyan’s early Mystics met, with considerable semi-secret fanfare, on the top floor of North College until that building was destroyed by a fire in 1906. According to some sources, that fire was started by candles used in a Mystical Seven ritual. After the fire, the Mystics purchased a plot of land on Wyllys Avenue, and Prof. Elmer T. Merrill (“Erato,” Class of 1881), designed a seven-sided temple with seven-sided windows and many other heptagonal features. Dedicated in 1912, that building was used until it, too, succumbed to fire in the 1980s. While Wesleyan can’t claim opposing Presidential candidates among the members of our secret societies, many prominent alumni, including banker and president of the Board of Trustees George W. Davison (Class of 1892), historian Carl F. Price (Class of 1902), judge and president of the American Bar Association Arthur T. Vanderbilt (Class of 1910) and numerous others, were Mystics. Next door to the remains of the Mystical Seven templum stands another small, secret building, the home of Skull and Serpent. This group, which also still exists, was formed in 1866, as a direct rival to Mystical Seven. The Skull and Serpent building was designed by Henry Bacon, Wesleyan’s campus planner and the architect of the Lincoln Memorial. Although not initially the case, today Skull and Serpent seems even more secretive to the uninitiated than does Mystical Seven because there is not as much information about it publicly available. Nineteenth-century student secret societies were much influenced by freemasonry, transcendentalist thought, and various types of fraternal associations. Interest in such organizations has waxed and waned over the years. During the Civil War and the two World Wars, not surprisingly, student involvement diminished somewhat, but the secret societies bounced back during the periods immediately following. After a period of less activity beginning in the 1960s, Mystical Seven was revived in the mid 1980s. Over the years, other types of student societies became more prominent, but the secret societies did not die out completely.